I’d never read anything by W.S. Di Piero before this book, which I read primarily at cafes not in San Francisco. Di Piero starts the book by addressing, you, the reader, “Life, as you say, my friend, / is lived in its transitions.” Life is funny like that. The first poem, The Running Dog, involves a brunch I could envy “A breakfast of poached eggs, / spiked coffee, newsy talk, / crushed sun behind the clouds, / marine layer vapors phasing / blue to green, and the body / quivers through its days.” In fact, like living in San Francisco and eating brunch, there’s a lot about the life of the poet that seems enviable, depending on your disposition. I would highly recommend this book if you appreciate poemy poems full of foghorns, flowers, and random interjections in other languages. Di Piero prides himself on sound and music, and there is a certain music in these poems – while they’re unrhymed free verse, there’s a recognizable rhythm and music throughout. The poem Sleeping Potions reminds me of a story I heard from a local bike mechanic: A man came into his bike shop, and took a used bike out for a test-ride. The man never came back. He had left his bag with a laptop, credit cards, wallet, and other valuable things, at the bike shop as collateral / insurance. A few days later the bike shop gets a call. The police had found the man “several hundred miles” north of the bike shop – he had no explanation for what he had done – he didn’t know or remember the previous several days. The bike was returned to the shop and the man got his bag and valuables back. But what happened between the shop and hundreds of miles north? And what’s happened in Tombo during the intervening fugue paragraph? We’ve moved from Hayes Street, to Duboce Triangle, to the N-Judah. We’ve got a look at Market and the Mission and Dolores Park. 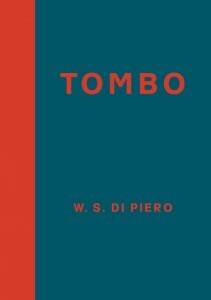 Di Piero has said that his books “start out as miscellanies.” The poems in Tombo don’t have the kind of narrative arc or grand teleological direction. They’re brief meditations. “If my poems come out right, they tell what it feels like to live in a world of troubled relatedness,” Di Piero said in an interview. I like this idea of troubled relatedness – and I think it’s an interesting way to talk about poems. Isn’t a poem generally a collection of objects caught in a troubled relatedness or interconnectedness? I think it’s possible to think of poetry simply as that. In Di Piero’s work sometimes this manifests itself as lists. “Stingy brims, flip-flops, and guayaberas,” or “Acid overnight coffee, fig jam, her star-flecked pajama bottoms’ flannel firmament.” But it’s hard to get over the fact that this is the San Francisco of someone who is overall doing pretty ok, and overall there’s a level of beauty and music and harmony emphasized in Tombo, which could be accused of ignoring the dirty, ugly, and undesirable of the place where the book is primarily set. In the title poem of the volume, a narrator looks with some bemusement at someone in Safeway who is probably suffering from mental illness. It’s a poem that’s hard to nail down; what is the tone and what is the attitude? Where does it leave us? his fellow seekers, and picked his naked feet. in the slurpee glaze upon the freezer case? In that elder by the yoghurt shelves? and felt my silly bones collapse again. and security spoke kind words to our prophet. You’ll have to buy the book to read the rest. What makes me so uneasy in this poem is exactly antithetical to the urge to acknowledge “troubled relatedness.” Here the narrator expresses a want for less mess, for tidiness. The “prophet” of Tombo apparently has it really easy because of his world view and is kindly told to leave the Safeway, but the no doubt friendly security guards. One wonders where said prophet proceeds from there, as the narrator is lost in reverie and nostalgia for childhood. Di Piero said in the interview with McSweeney’s, who you’ll remember, published the book being reviewed: “I don’t read a lot of contemporary poetry by poets under, say, fifty, but much of what I do read feels cool and soundless. My vague sense is that poetry since the early 1980s has become more concept-driven, and talky but not very sensitive to sound, texture, beat.” I’ll let you make your own judgments on Tombo, and the cool soundlessness of contemporary poetry, but I’ll send you off with one complete poem from Di Piero. or snipe or curlew, that I could speak and speak. Why weren’t you with me? What waited there was something else. the shallows, light dying on their backs. They seemed to be themselves the moving waters. of exclusions, of what might have been birds. Leif Haven is a writer living in Oakland. He edits a small press called Persistent Editions.